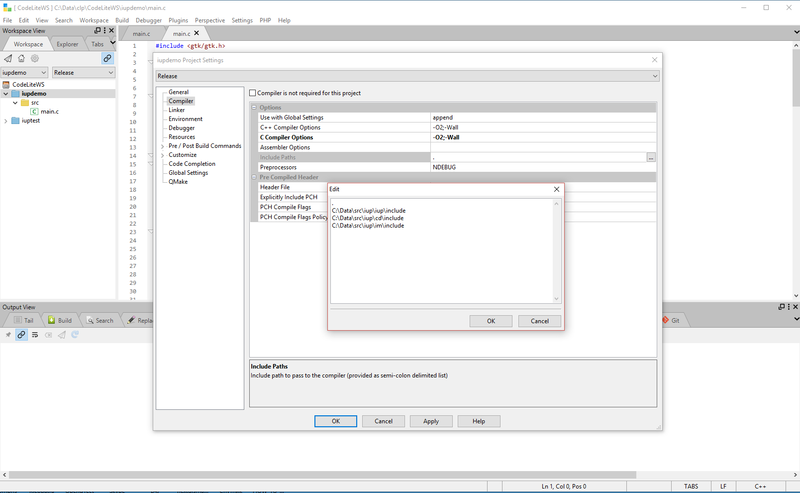 This guide was created using CodeLite 10.0 IDE in Windows 10 x64 bit OS (but similar configuration also tested in Linux). 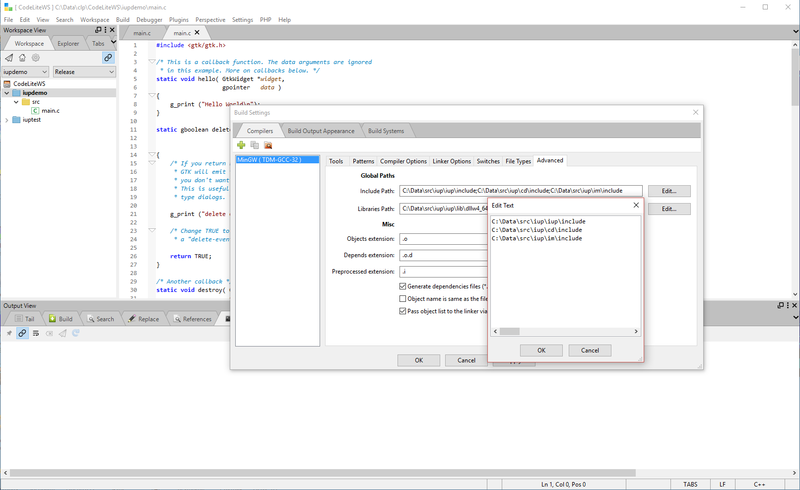 CodeLite is free cross platform, open source C, C++, PHP and Node.js IDE developed by Eran Ifrah. 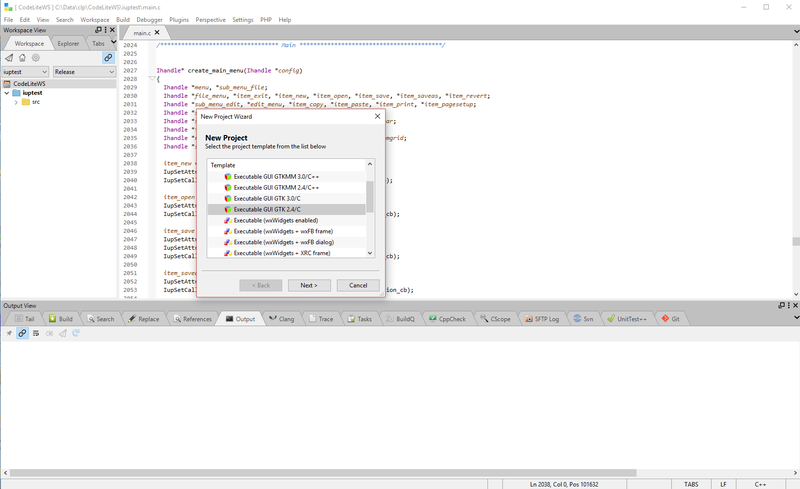 It was created especially for wxWidgets GUI projects development, but it also could be used for IUP, IM, CD project. CodeLite would create default main.c file designed for GTK libraries usage. Remove default content of that file and replace it with required one for IUP/CD/Project or add your own file to the. After creating the project you must configure it use IUP include files and libraries. Select your project and use option "Settings...", that would be available when one press right mouse button (MB3). · Remove: "; $(shell pkg-config --cflags gtk+-2.0)" in "C Compiler Option"
Do not forget that same procedure would have to be repeated for both Debug and Release configurations. They got different settings !. · Add required path entries to the "Libraries Search Path"
· Add required libraries that would be required for your project in "Libraries" line. 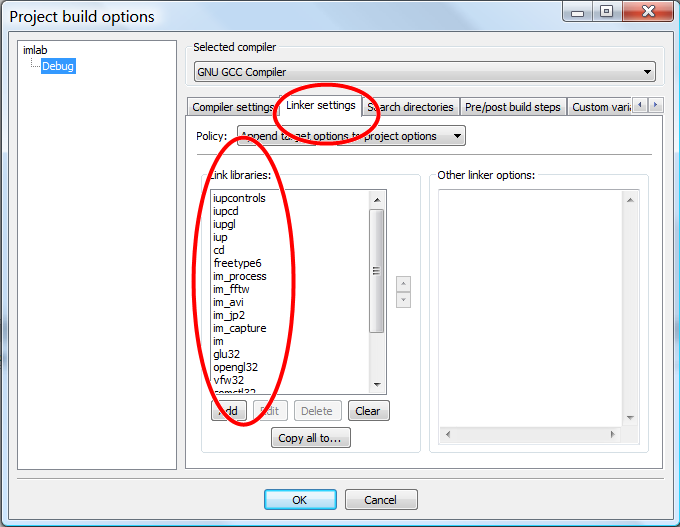 Another possible option is to add required libraries path and include files path in global CodeLite settings: "Settings -> Build Settings -> Compilers -> Advanced" and set required "Include Path" and "Libraries Path"
· In Windows steps mentioned above would allow you to build IUP/CD/IM applications. 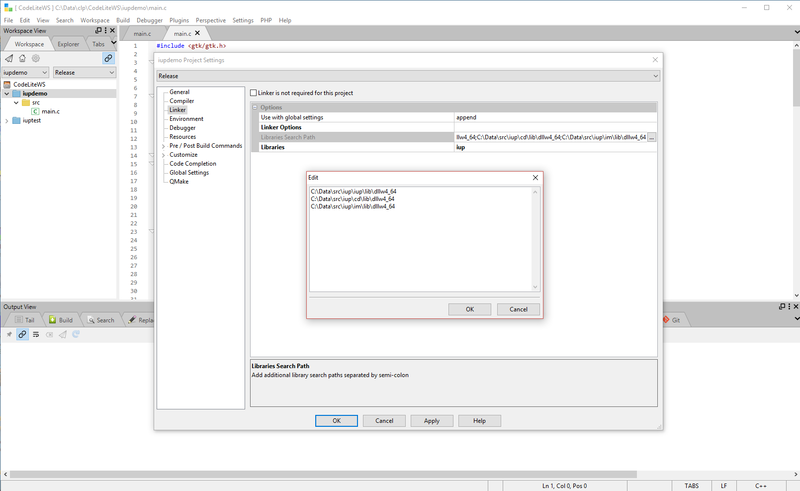 But if you would try to use "Run" option - system would unable to execute your new application because path to the required dll files would not be found. To overcame this problem one could put all required dll to the directory of your choice (in my case I use C:\Tools\IUP) and add this directory to the PATH Windows environment.